Data catalogs, a category of product in the broad field of data governance, are emerging in popularity. That popularity has been brought on by the twin enterprise mandates of complying with data regulations and herding the growing number of repositories in the corporate data estate. But data catalogs are a legacy product category too, originally stemming from simple data dictionaries – essentially table layouts with plain-English descriptions of tables and fields. Today’s data catalogs have grown in capabilities, importance, and integration with other tools. Read this report to understand how data catalog platforms help organizations inventory their data by documenting data set content, location, and structure; and aligning business and technical metadata. 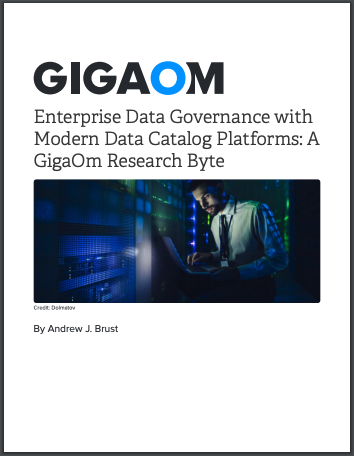 This report will describe the ways a data catalog helps an enterprise have complete control of its data. Curabitur pharetra, neque a rutrum posuere, lacus lectus convallis nisl, convallis interdum risus tellus sit amet ante. Aenean at velit erat. Vestibulum eget pharetra est. In luctus mattis diam, eget pellentesque quam vehicula a. Suspendisse quis arcu ultrices orci molestie iaculis. Ut fringilla, arcu sed consequat pharetra, nisi enim interdum odio, nec ornare arcu eros ac ipsum. Integer vel porttitor libero. Aliquam eget finibus justo, vel accumsan quam. Sed quis rutrum mi. Donec quis lacus dui. Vivamus nisl nisi, rhoncus sed velit sit amet, consectetur vehicula est. Aliquam magna purus, feugiat sit amet erat in, semper convallis mauris. Nullam vel nunc sed urna malesuada finibus id non diam. Interdum et malesuada fames ac ante ipsum primis in faucibus. Nunc aliquet quam tortor, ut convallis nunc suscipit et. Vestibulum ante ipsum primis in faucibus orci luctus et ultrices posuere cubilia Curae; Sed leo tellus, convallis vitae aliquet non, ultricies eget libero. Nam convallis ac tortor ut dignissim. Aliquam vehicula, ipsum at vulputate ultrices, nisi ante laoreet libero, ut auctor ipsum elit at odio.